I love that you’re always introducing me to new things, and these sound yummy. I was inspired by you this week and attempt to go forage for sweet chestnuts, it was a bust though I think the squirrels beat me! I wish we had chestnuts around here, but don’t. They are probably the best thing you can get from a tree. But all nuts are difficult, because of the competition out there, and the squirrels know which ones are best. Hope you managed to find some – nothing quite like fresh chestnuts. I’ve never baked with chestnuts before because you can only really buy them around christmas and then they’re crazy overpriced and not very good, I’ve gotta get up earlier than the squirrels I think! Wish I could give you some of my tubers. They are so ridiculously easy – just be sure to give them their own space. I love this. Never thought to use them this way. Thanks. Well, how awesome are these? Very cool and interesting post, Hilda!! 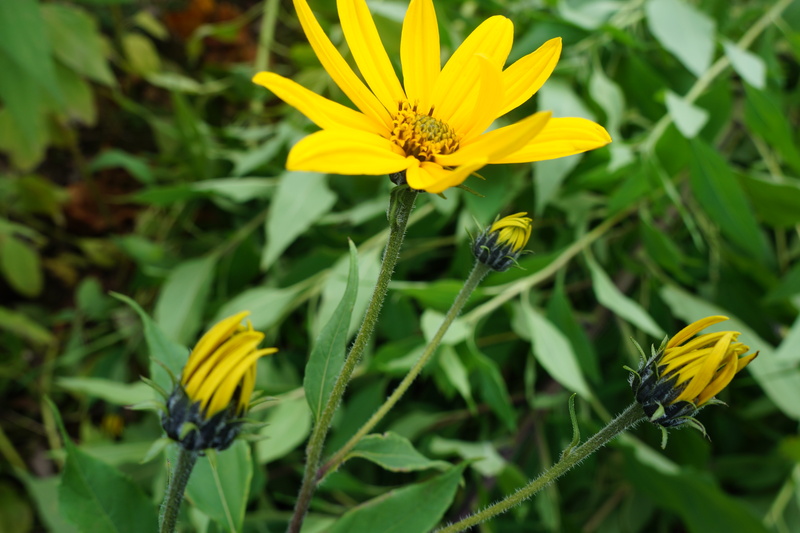 Do you think that Jerusalem artichokes will grow in British Columbia? I would love to plant some! I would think that they would grow in BC. I’ll ask my BC friends. Yes, a drink would be a great idea – something really seasonal would be nice. Meanwhile, enjoying the party and getting lots of great cooking ideas. The artichoke part is because of the flavour – the Jerusalem part is because of their orientation towards the sun – like in Italian ‘girasol’ or ‘turning to the sun’. But you can see for non-linguists, girasol might sound like Jerusalem. Hey, me too, sort of. That is I studies linguistics as part of my training for language training, and loved it. Love artichokes frankly! I don’t think I would have any trouble getting these artichokes eaten while still warm 🙂 sounds delicious! You are just a font of information – I had no idea that they belonged to the sunflower family. I used to make a soup with them but your chips/crisps look so much more inviting! Thank you for co-hosting this week, hope this rowdy lot don’t wear you down!! Happy Fiesta Friday to you! Thanks, Selma. Happy Fiesta Friday to you too. I have no idea about this newfound artichoke. So happy to come here at your blog and read about it. I particularly like how you make flour out of them, and use it for many more dishes. I was familiar with Jerusalem artichokes but thought, um,,,, that they were artichokes! These chips look really good Hilda. You provided an education for me today! Are you busy getting ready for Thanksgiving? Have a really wonderful celebration! Thanks Johanne for stopping by and commentingI hope you get a chance to try them some time. Luckily for me we are going somewhere else for Thanksgiving dinner, so I am off the hook. That gives me more time to do cooking that I want to do. Happy Thanksgiving!!!! If we get invited elsewhere my sons insisit I recook the whole meal at home the next day so regardless, I cook:) but they are hearty eaters and I don’t mind. Last year I was In Toronto for the Canadian Thanksgiving. 🙂 Enjoy Hilda. Thanks. I will probably do a Thanksgiving type dinner at some point – just not the official day, and will wait till my children or someone can come and visit. I am looking forward to getting some Canada geese, so that’s what it will be. Thanks so much, Naina. I am seriously going to make your bean curry recipe, so you see the feeling is mutual. Thanks, Linda. I am going to look up the spicy chtitha recipe. Sounds intriguing. Thanks for hosting FF. Now I know what to do with sun chokes! They’re such strange little veggies. They really are, but they have so much potential, in moderation anyway. Thank you for hosting this week! I just saw Ann Burrell on the Food Network cook with these and was intrigued. I’ve never seen these plants. Is the plant itself called a sun choke? What zone do they grow in? That is a good question. I think Jerusalem artichoke and sunchoke are pretty interchangeable. I prefer the former, but it is good to recognize both. The plant grows in Europe and NA and I believe other continents, but not sure just where. They grow in the northern 2/3 of the States, and that includes N. Carolina from what I’ve read, so fairly moderate to cold climates. WOW! Now this is something I have to add to my garden!! How very interesting and beautiful! Tune in next year to see if I was successful! LOL Thanks for hosting FF! Cheers! Thanks so much Lori. Let me know how your crop does next year. Thanks Lori. I like your creativity too with your chocolate coconut cookies. Thank you so much for posting this delicious recipe! I am going to try making these soon! Very interesting! I have never come across this vegetable before! I’m sure I never had this chips but would wanna try to make it and eat a lot of it! Happy Fiesta and thanks for co-hosting this week’s party, Hilda!!! Hi Hilda I always learn about new things from you. I have never had Jerusalem artichokes before so thanks for introducing! And the recipe looks so easy too. I would love to try it sometime. thanks! This is unbelievable Hilda… your creativity doesn’t have limits! 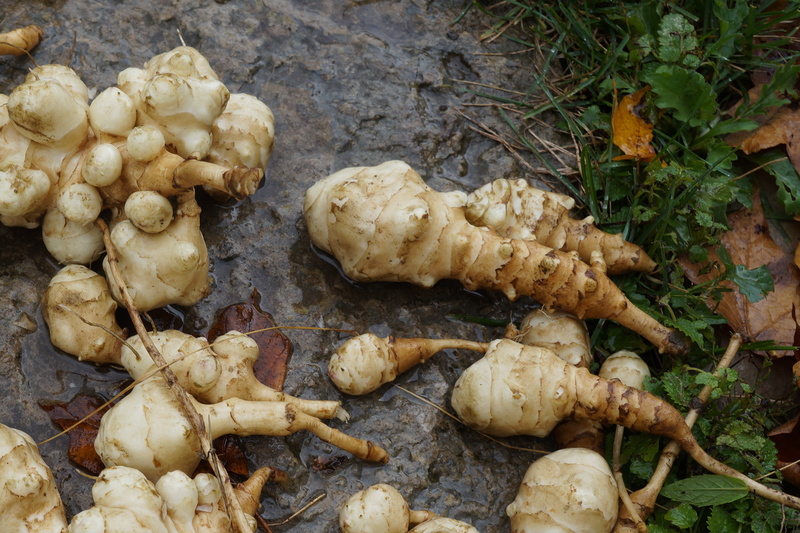 I do love Jerusalem artichokes very much, I love the flavour which reminds me the regular artichokes (so hard to find good once here in Montreal!). I’ve tried to make a lot of recipes with them, but I would thought to use them in order to make chips! I bet the flavour has to be “improved” with lemons and coconut oil…. Thanks a lot for sharing this recipe, I’ll try to make it! Thanks for your kind comment. I hope you enjoy them. I’ve never sen these tubers, but if they are easy to plant, maybe I should look for them. Such thinly cut chips, look delicious! Thanks for dropping by. I could never have cut them that thin by hand, but with a food processor the job is quick and consistent. This post made my day. We have tonnes of sunchokes. The side effects are a bit overwhelming but chips sounds like a good option. Thank you. I can’t make any claims, but either the process or the small amount seem to have no effect. I also find that dried chokes are quite easy to eat. Maybe the cooking reduces the effects. They look good. I just dug up my sunchoke patch and I had a great harvest! Which means I have a million of the darn things and need more ways to cook them! I have a huge pile of them too, and they’re not something you can eat every day, so I dry most of them and make them into flour – used to thicken sauces, make pasta and bake with in small amounts mixed with other flours. I’m still trying to think of ways to cook them. Roasted with other vegetables takes care of a few. They don’t keep well after being cooked, so just prepare what you can consume. Good luck with them, and if you have any ideas, do share.